You have probably noticed that Microsoft updated Office 365 in late Feb 2013 and is slowly rolling the updates out to existing customers. For the third time in recent years Microsoft has moved all the interface items around a little and renamed functions from how they existed previously. I am mostly in support of the refresh as it looks cleaner and more items are in the right and logical location. However, if you have spent the last year working with the pre-Feb interface you now have to unlearn where some items lived. As this is a cloud product that gets updated automatically there is also no opportunity to keep a legacy version of the app interface to get that warm and comfortable feeling of knowing where everything is for just a little longer. The day it changes is the end of the interface as you knew it. With that being said some of you may be looking for the shared namespace functionality, especially if you are going to perform a migration and co-exist with an on-premise Exchange server. 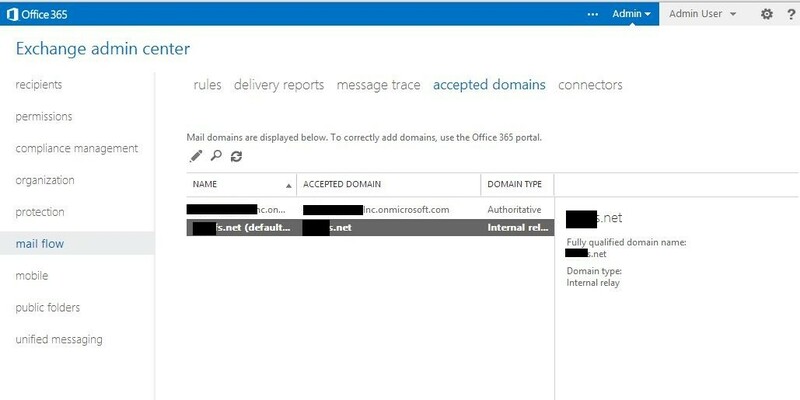 So prior to the refresh if you needed to tell Office 365 that your SMTP mail domain was shared rather than hosted only you would go to the main Office 365 portal, then under the Exchange component you would click Manage. That would open up the ECP or Exchange Control Panel and if you clicked on Mail Control and then Domains and Protection you would see the list of your Domains. You could then edit the Domain Type between Shared and Hosted. For the new release of Office 365 post Feb 27th 2013 the Shared / Hosted terminology is not used anymore. Click on the Admin button and then select Exchange from the drop down. You will then get a new window open in your browser and you are in the ECP. 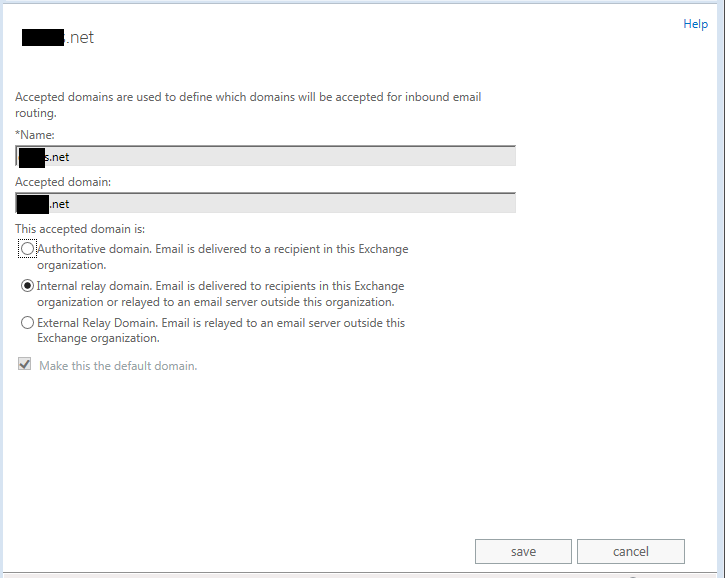 Now navigate to Mail Flow and then Accepted Domains. If you have already Verified your domain you will see at least two domain entries. Now choose the Internal Relay Domain option and click Save. This will now perform the same as a Shared namespace option of previous versions.